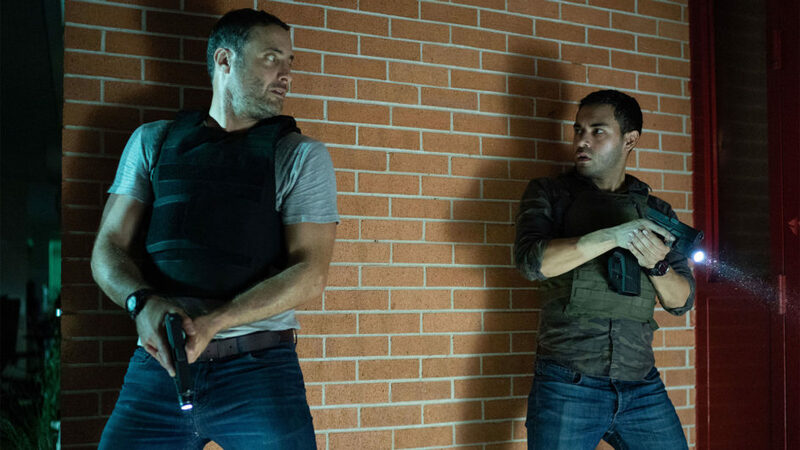 Pete the Cop (Dominic Fumusa) teams up with Miguel (Gabriel Chavarria) in The Purge's Season 1 final confrontation. As a film franchise broken down into two-hour increments, The Purge seems to fit nicely into a tight narrative. But as a “10 episode television event,” the storyline gets stretched to its limits, even if there are more than a few entertaining plot twists and storyline turns. For five episodes, I was thoroughly entertained with this TV series. Unfortunately, not all of the main characters were worth writing home about. There was a creepy cult traveling in a blue bus. There was a love triangle with a twist, as the wife has an affection for the rich, unstable temptress, who was picked up at a bar. There was a businesswoman with an urge to kill her sexual predator boss. Then there’s the former Marine who’s looking for his lost younger sister, who gets into a TON of trouble trying to track her down. There’s lots of expendables in these storylines, but it’s the last characters who are the best (and which the series should have revolved around, not the others). Miguel (Gabriel Chavarria) and Penelope (Jessica Garza) Guerrero are the stars of the show, while Pete the Cop (Dominic Fumusa) is a great supporting character, as are the Matron Saints, a female militia working for the good guys on Purge Night. Not everybody out on the streets are looking to relieve their pent-up anger issues, but they do seem to have a hazy shade of gray regarding evil intentions. Politics have ALWAYS been ingrained within The Purge movies, so there’s no shock and awe to see the political games taking place inside and out of the main storyline. Transitioning from R-rated feature films to a basic cable TV show is apparent at times. There’s not too many people shown rioting and killing in the streets (like in the movies), which may be due to budgetary issues, but people are shown in different corners of the city. There’s terrific visuals and a few jump scares scattered about, along with a flashback reference to The First Purge. Multiple f-bombs are spoken per episode, which felt forced — not edgy. And the Tarantino-esque coincidence where all these random characters are grouped together felt incredibly unlikely. The ongoing storyline was predictable at times, but overall, it was pretty good. This is the PERFECT series to binge around Halloween, so why did this limited series wrap up in November, instead of around All Hallow’s Eve? A mini marathon aired on USA, but the series just wrapped this week. That feels like an incredibly missed cross-promotional opportunity. It’s already been announced that there will be only one more film for The Purge franchise, but also that the series will return for Season 2. I really enjoyed the factoids displayed during brief commercial breaks detailing storyline bits, so I look forward to even more next year, but what will be the main storyline? I really hope either the final movie or perhaps the series will show in detail how the New Founding Fathers of America came into control and used their power to influence the country.